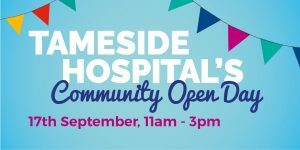 Tameside and Glossop Integrated Care NHS FT is delighted to announce this year’s Community Open Day will take place on 17th September 2017 at Tameside Hopsital – in the giant marquee. Live programme of entertainment including DJ, brass band, dance troupe etc. Every year we welcome over 1000 local people to our Community Open Day, it has become a key date in our diary and we hope you can join us on the day!